Since 2016, SageGlass has partnered with the Technical University of Kaiserslautern in Germany on a collaborative research project focused on the building envelope, lighting technology and controls. SageGlass was installed in the Living Lab Smart Office space, which is an actual workplace that tests innovative and smart solutions that aim to provide individual comfort to building occupants. 1. Tell us about the Living Lab Smart Office space and the research work being done there. The Living Lab bridges the gap between lab tests under controlled conditions and real field use where privacy issues limit the amount of information that can be collected. In the Living Lab Smart Office space we develop, evaluate and optimize technologies that improve office workers’ visual, thermal and acoustic comfort. We investigate new methods to provide local and individual user-controlled heating and cooling systems. An important area of interest is the use of dynamic façade systems to control solar load and daylighting. 2. Could you describe what is going to be studied in the work tasks relative to SageGlass and which approach and methods will be used? 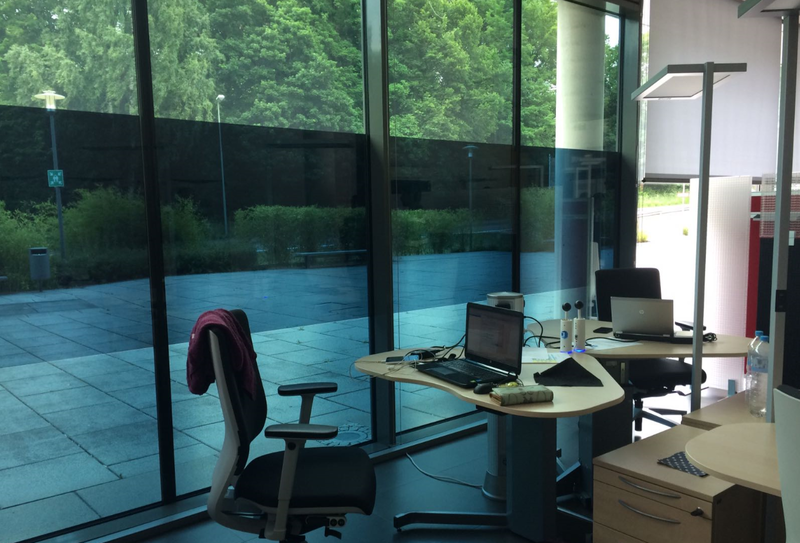 In the three-year research project LiSA – Light and Solar Management with active and model-predictive controlled components, which started in Dec. 2016, we are looking at innovative methods such as electrochromic glazing (EC glazing) and new control strategies. We thus have installed SageGlass panes on the eastern fully glazed facade of the Living Lab. The whole window area has been divided into three different horizontal zones to block direct sunlight according to the incident angle. In a first step, we set up an online tool through which users can tint or lighten the SageGlass EC glazing by changing its light transmission. Every 15 minutes, users in the Living Lab fill out a survey regarding thermal comfort, workplace illuminance and glare. This is important information to help further develop a control strategy according to each situation. In addition to the direct control and feedback from occupants, we run simulations to predict uncomfortable situations based on measurements. And finally, we develop a predictive control strategy model based on weather forecast to make the best use of the available solar energy to reduce cooling load and artificial lighting. 3. Could you explain your motivations for testing a technology such as SageGlass? The idea of electrochromic glazing is very intriguing. The glass can be fully transparent in winter when heat needs to enter the building, and in summer, when overheating needs to be avoided, the transmission of solar radiation can be reduced by tinting the glass. Really low Solar Heat Gain Coefficients (SHGC or g-values) can be reached, which are favorable for highly glazed office buildings. The switching does not cause any noise, and the absence of a mechanical system reduces maintenance costs. One of the biggest advantages over exterior shading systems is certainly that there is no additional constraint regarding wind loads, so the glazing can be used in high-rise buildings. 4. To date, what conclusions could you already draw regarding SageGlass and its contribution to the building’s energy efficiency and occupants’ comfort and satisfaction? We know from previous simulations about SageGlass’ potential to significantly reduce heating and cooling energy in the building. Once we validate our thermal simulation model, it will be interesting to see how SageGlass performs compared to the exterior shading system that is also installed and investigated in the Living Lab. The personal opinions and conclusions of people working in the Living Lab are already very positive and encouraging. The darkest tint reduces glare to a tolerable level, even on this east-oriented façade that is very subject to glare. We also noticed that people experience much less thermal discomfort when they choose a workplace in an area of the Living Lab where the SageGlass panes are installed. 5. Which other innovative technologies are being investigated at the Living Lab, and how do you envision their integration with SageGlass? We have several devices enabling a “personalized environment,” such as heating and cooling office chairs or heating and cooling partitions. We started using the information on how users control these devices as input to the central building HVAC systems. In the next step, this information can also be used to control the electrochromic glazing to avoid thermal discomfort. Another interesting research area is how LEDs can be adjusted to provide the best lighting conditions within the space. Here too, an exchange of information between artificial lighting and the façade system is desirable. Stay tuned for our next blog post on the Living Lab Smart office space field study! More findings regarding the use/control and effect of SageGlass in the Living Lab are to come. Prof. Dr.-Ing. Sabine Hoffmann (born in 1972) was appointed full professor at the University of Kaiserslautern in 2014. She is now head of the department of Built Environment. After graduating in building physics, Dr. Hoffman did a PhD researching the use of phase change materials (PCM) in buildings. She then worked a few years in industry on building physics–related topics of the building envelope, then came back to research in 2010 and worked as a senior researcher at Lawrence Berkeley National Laboratory and University of California, Berkeley, United States. The Chair of Built Environment concentrates on components, plants and systems in buildings. Management of heating, ventilation, air conditioning and lighting, and control of the building envelope are tasks for which new and innovative solutions are being developed. The multinational team uses a decentralized approach and focuses on the interaction between humans and technology. The goal of the team’s research is sustainable buildings that are operated in an energy-efficient and economically sound way and that provide maximum comfort for occupants.